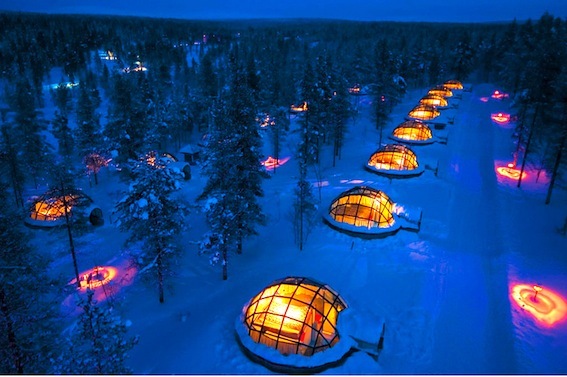 Hotel Kakslauttanen is located in the Saariselkä, amidst Lapland scenery in the Urho Kekkonen National Park, Finland. Apart from featuring 40 hand built traditional luxury log cabins, from December to April guests also have the choice to stay in traditional snow igloos or futuristic glass igloos. The tempered glass of the igloo keeps a comfortable, warm temperature inside while allowing you to truly experience the northern skies; not to mention they have a snow bar built near by. Kakslauttanen Hotel also conveniently features the worlds largest smoke sauna, and is equipped with 5 restaurants spanning from local to exotic cuisine. Winter activities offer husky, snowmobile or reindeer safaris, ice-fishing and cross-country ski trails while summers offer fishing trips, gold panning, hiking and experiencing the midnight sun from May to August.